Used to protect my pots and pans from scratching each other while stacked in the cabinets. Fit's all sizes. Wished I found these sooner. Use these pan protectors in between my Teflon frying pans and glass lid to keep them from getting scratched. Works great. These save so much wear on pans and skillets that we stack in the cupboard. Sure keeps them from getting scratched up! THE SET I HAD PREVIOUSLY WERE FALLING APART. SO REPLACED THEM. This product is good for pots and bowls. I also use them in the travel motorhome to protect my items and keep the noise (rattling) from occuring. Great product, I wish I had ordered these a long time ago. I have new faily expensive cookware and wanted to protect them. These were just what I was looking for. I love these pan protectors. They protect the pots and pans better than paper towels because they are thicker. They are sturdier too, so they are easier to take out or put back when getting a pot or pan from the cupboard. A Really Nifty Kitchen Gadget! I have actually had a set of similar pan protectors for several years and like them very much. My son asked for a set and I ordered these for him. He was very pleased with how quiet it made the pans when stored together, and of course it helps to protect non-stick finishes from scratches and nicks. Great product! Everyone should have a set! Good between platters or large ceramic or glass platters that you store stacked. 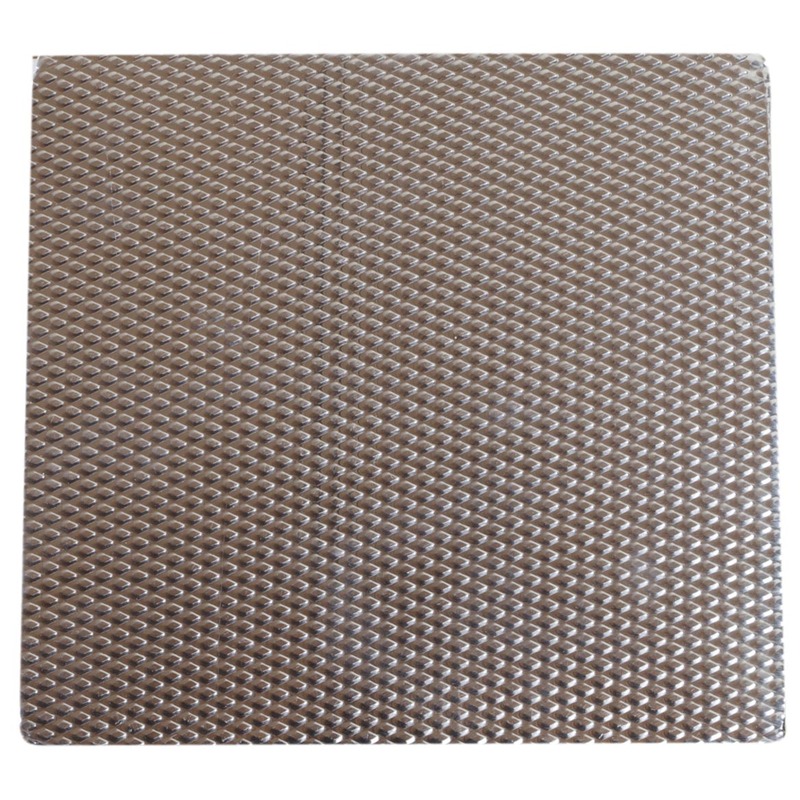 Keeps your expensive pans from damage when stacked, easy to use and effective. The product was purchased to be a gift for my daughter-in-law who recently purchased a new cookware set -- I'm sure she will be delighted that her precious pots and pans and lids will now be protected and therefore last longer and look better. If you value your non-stick pots and pans, you absolutely need to use these pan protectors. Sure beats using wax paper ! Its great to use for my frying pan and I have no worries at all to stockpot them. These are handy, and do a great job of protecting nonstick pans. 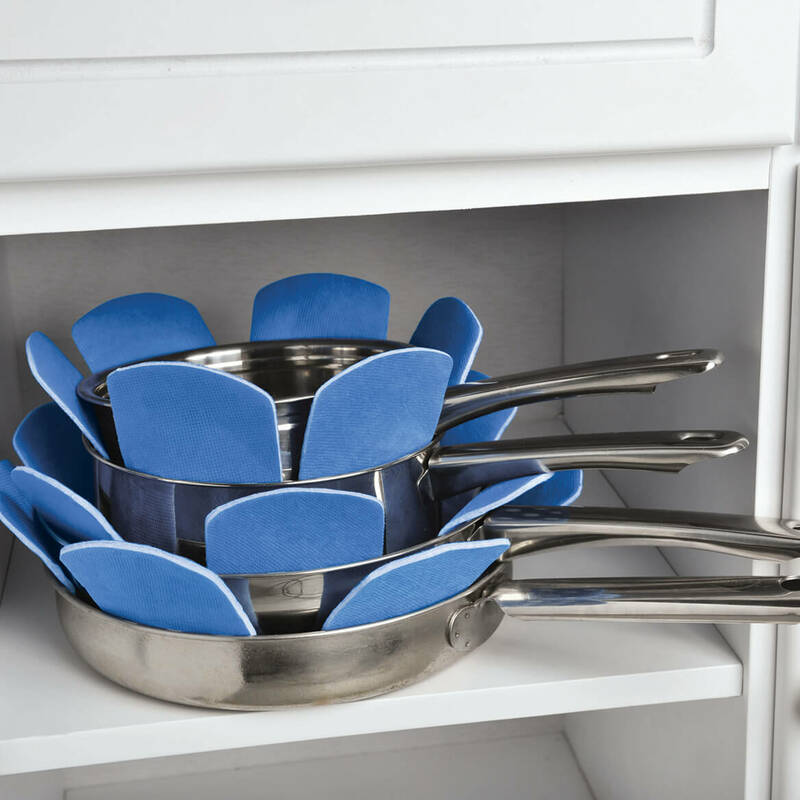 If you are the type to stack your pans, regardless of nonstick or not, use these! I put these in between my Calphalon pots & pans as it keeps them from getting scratched. Just wish there were more than three in a pack, that would be more economical. Another great product. My non-stick pans are finally maintaining their surface with no scratches after all these years. I have to stack my pans on top of each other because of space and these pads really keep my pans looking good. They are easy to use and they are really "cute." These pan protectors help keep the teflon from scratching off when I stack the pans. Protectors go inside each pan to ensure that we dont eat the teflon. Great product! These are for storage of pans when stacked. Do not cook with these. Only for storing pans!!! My daughter-inlaw and I like them a lot. I like to put them between pans and lid that you stack in your cabinet. They are great!! I actually bought these pan protectors for a daughter-in-law who is an avid cook and entertainer. She has expensive pans and was using paper towels to keep them from getting scratched and rubbing together when stacked. For once I was able to find something special she had never seen before! I bought 11 sets for her! I love my pan protectors, my friend sugguested to me that I buy them, she ordered hers from here as well, she got one set than reordered another. I used to use paper towels between my pans to stack them, but these work so much better and are so easy to use. They have been a great addition to my kitchen! 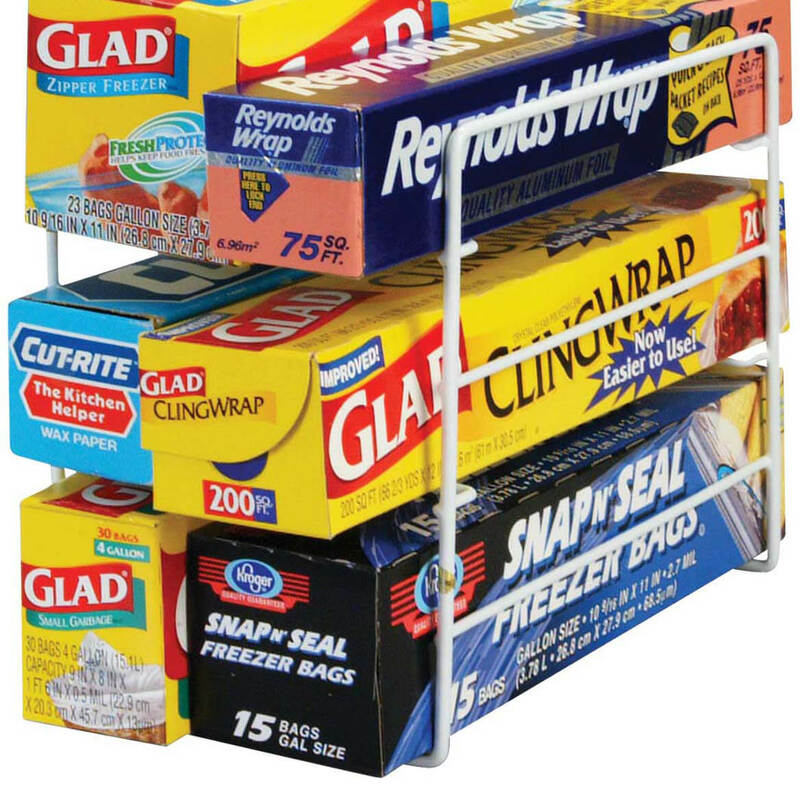 the product works very good for the utensils that i have. Sharing softness with my daughter. Like mine because they protect my cookware from scratching. Also great as a trivet for hot dishes. 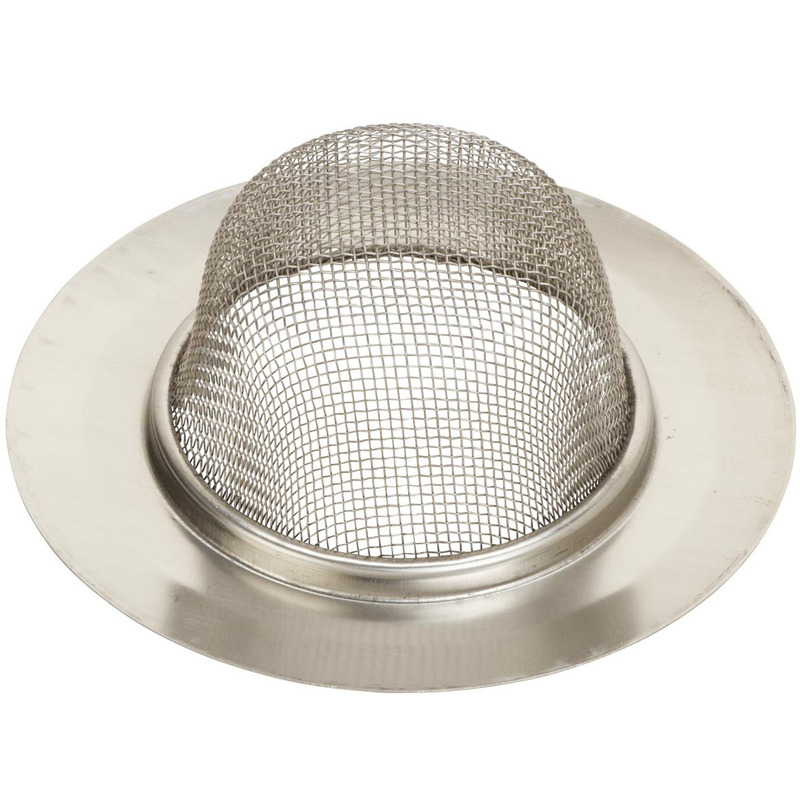 This keeps pots & Pans, glass bake ware and other cookware pieces separate so that they do not scratch when stacked. I now have 4 sets and use them in between everything! Great for keeping your pots & pans from being scratched. I use these in my RV to keep my pans from rattling together, and they work great. I have these at home to protect my frying pans and like them so much I bought some for my camp. I will buy more of these for myself and others. I love these cushioned pot and pan protectors; I will be buying more. They work great and are very attractive. Besides putting them between my teflon coated pans, they make good trivets for hot bowls and dishes. A WONDERFUL product that actually works! I own a great deal of CORNINGWARE and not having a tremendous amount of storage, I like to stack the pieces. Placing these in between each piece is wonderful -no scratching or worrying about damage. I now own two sets and use every shield! They are also great for separating my fry pans- again no worries about scratching surfaces. I am personally not crazy about the bright blue color - black,grey or neutrals would have been my preference but hey - it works. . . the color is only seen and does not detract from the function of the product. I use them between all my pans. My sister-in-law wanted these, too. I have a George Foreman grill with several non-stick plates to use in it. I put these soft protectors between them in my cupboard. You can cut them to fit. These pan protectors are the greatest! I have a cabinet organizer to stack large size frying pans on, but had to resort to paper towels to stack eight inch fry pans until I discovered these pan protectors. They are just right to keep my pans from scratching each other. Pans are too expensive to replace. Someone had a good idea! Bought these to leave as a surprise gift for the friend who loaned me her condo in Florida for a week. I think she will really like them for protecting her nice cookware and they will look great in her blue and white kitchen. I thought they would be made of felt, but they are a nice material which will probably last longer than felt. These are really great. They protect stacked pans from being scratched. Great idea! Much better than what we use to use-paper towels. I invested a lot of money in anondized pots and pans because they would work best with my new range. These allow me to stack my pots and pans and keep them from getting marred. You can cut them to the size you need. They really protect your pots and pans. Love them so much I sent a set to my niece who loves them too! I use this between my pots and pans. Before I would put papertowels between the pans so they don't scratch but these work so much better. They are very attractive. It's very easy to use. Don't judge it by its look. Like it. They work well in my little kitchen. I like these! Now I'm not using dishtowels to stack skillets. As other reviewers have said, these pan protectors sure beat paper towels, and I'm glad someone invented them. My kitchen is small, so I have to stack my cast iron pans, and these protectors do a great job of keeping them from scratching each other or the cabinet floor. The only problem is that they're not really designed for this heavy a job; I use my pans almost every night, and the protectors' three separate layers eventually work themselves apart. I've had to replace them three times over the last two years, but the fact that I keep buying them tells you how much I depend on them. My guess is that they last much longer if you're just storing non-stick skillets. Great Idea, but. . . . I love the idea behind these pads, and use them to protect my expensive non-stick cookware, but the construction leaves something to be desired. I have re-glued the layers of three of the pads, and have cut down a couple of them for smaller pans. All of the pads are the same size and the edges come apart too easily, but aside from these minor flaws, I would recommend their use to protect your good pans. Can cut to size for different pots/pans. I will be ordering an additional set. I no longer have to use towels or other items to protect my high-end cookware bottoms and insides. Bought as a gift for organized gal. She was able to replace all those paper towels she used to use. Cute. Does job of keeping pots and pans separated better than a paper towel or paper plate. the Pan Protectors are very handy and keep the frying pans in good condition. glad a did order some, also for gifts. I bought this product for my mother who always put paper towels between her frying pans and pots. My sister saw them and loved the idea so I also bought her a set. Great gift idea. It was bought to be used between pots and that is the sole use. My sister was jealous of mine when we were packing my bakeware to move, so I bought her a set for Christmas! I try to keep my pots and pans clean and protected. Hate to buy a new pan and have it marred or scratched buy the one that nestles in it. It also makes my cupboards look stylish. 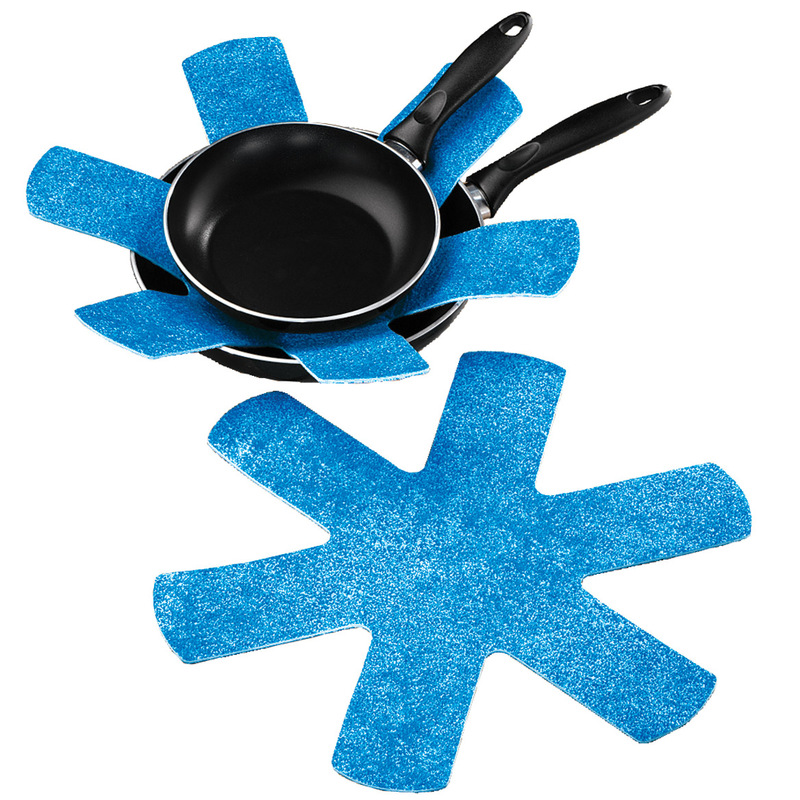 Thiese pan protectors are great for keeping your good set of pans from rubbing together. I've purchased 2 set now & this set was to give to my daughter. Great product does what it is meant to do. 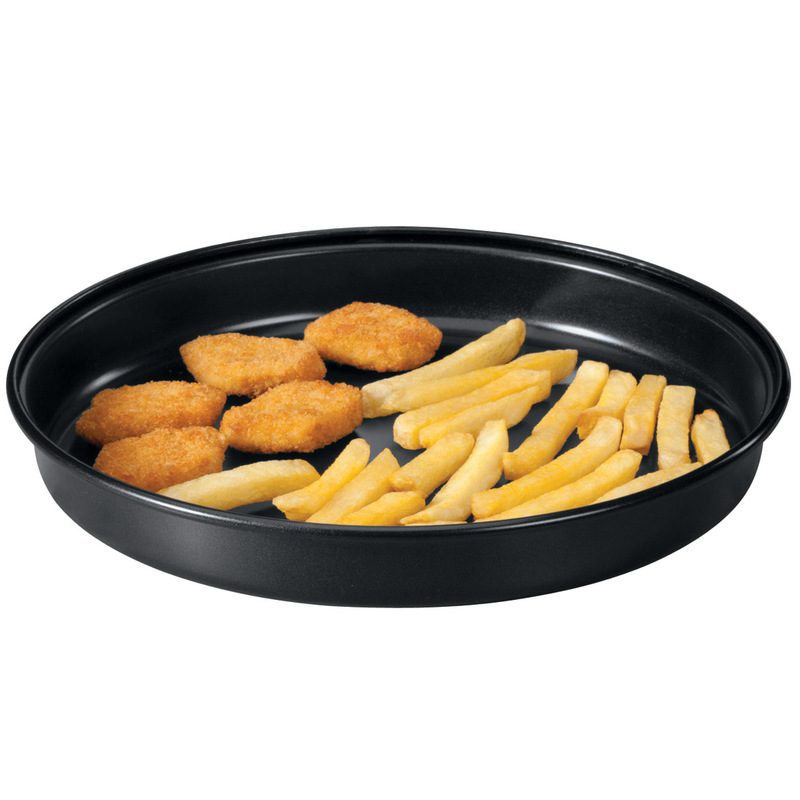 Would like it available in three sizes as it is too large for small frying pans thus taking up too much room. These allow me to stack my pans without scratching the non-stick finish. Disappointed that the blue side had white marks on them. When I opened the packages, I liked the product, but they had an unpleasant smell so I decided to wash them before using. Basically they separated layers and also left a mess in my washing machine of tiny white "beads." Cool idea for the kitchen. The cover attached to the foam design tends to strip off of the foam, and it comes apart. Good idea rhough! I tried them and ended up giving them away. It is so much easier, cheaper and more sanitary to just use a paper plate to separate my skillets. Just do what works best for you. Getting mine out of the house was the best thing for me! I like to separate my pots & pans that I know might get scratched. I have a similar item and wanted the same for my daughter. Liked that they could be cut and also machine washed. It was chosen to protect my expensive pots from getting scratched. Separate my baking pans so they don't stick and can easily be pulled apart. Protects the surface too. I wanted to place these between pots and large glass mixing bowls for my chef's table. Works great! I think it's better protection than the paper towels I have been using. I love this protectors. It keeps my pots and pans to protects from scratches when I stack them all. So much better than putting dish towles between my pots and casarole dishes. They are appear to be a quality protector. We will see once received. These are really nice to put between your pots & pans or bowls so they will not get scratch. have some and need more. Great protectors for good pans. 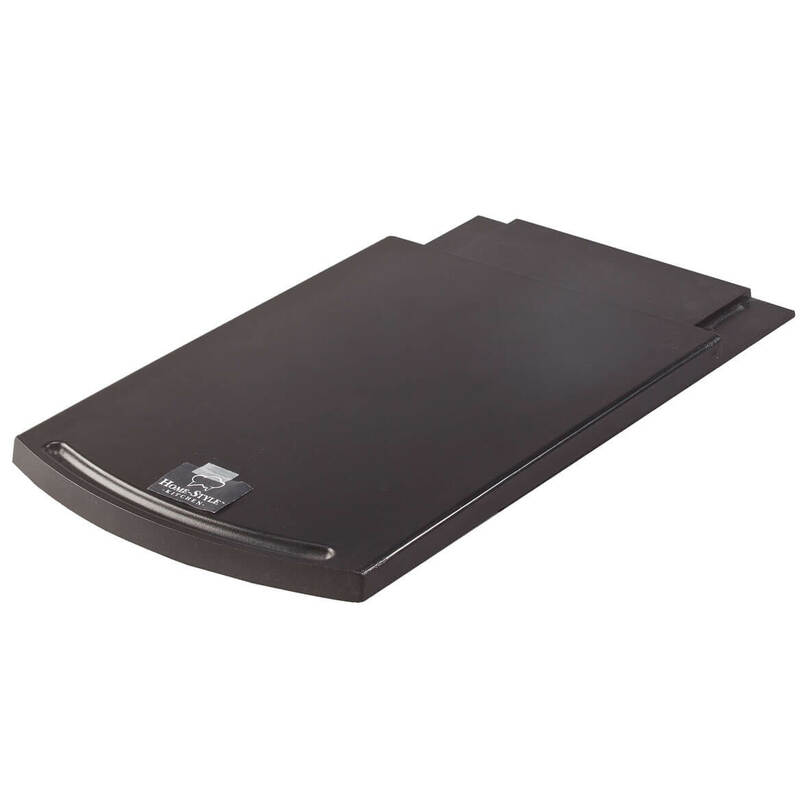 This item is hard to find and i want to protect my good pans. I have this product and I need some more. So awesome for protecting your non-stick pans. My mom loves these....very handy and durable. HAVE OTHERS, WORK VERY WELL. Love them, they keep the pans like new. To help protect my pans. The ones I already have work well but some are coming apart. I need to protect some pans that my son just got me. hop to protect my non stick pans from scratching. With a round table regular table cloths are always getting pulled one way or another. These stay in place. Order these really like them but didn't order enough.